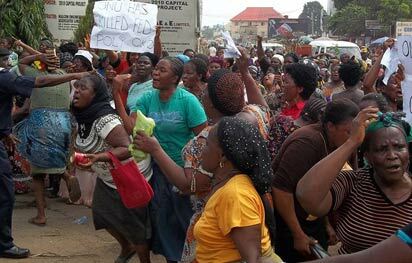 Hundreds of women, yesterday, embarked on protest, demanding the immediate removal of Professor Godwin Onu as rector of Federal Polytechnic, Oko, Anambra State. Not even the presence of heavily armed security men deterred the protesting elderly women who wielded placards with inscriptions, such as “Onu must go,” “We are tired of Onu,” “Appoint new rector for OkoPoly,” among others. The protesters, however, were not allowed through the polytechnic’s gates earlier shut by security men. Staff, who had business in the school were shut out, even as those inside school premises had to wait for the coast to clear. An eye-witness, who pleaded anonymity, said the women were accompanied by men and youths as a show of solidarity. Spokesperson for the women, who did not disclose any identity, lamented the continued assault on the people of Oko, disregard for the culture and authorities in the town and steady harassment of their children by private security guards engaged by the rector. OKO — Federal Polytechnic, Oko, Anamabra State has raised the alarm over plans by a faceless cabal in the host community to destroy the achievements of the current administration and scuttle the peace in the polytechnic. The Public Relations Officer, Mr. Obini Onuchukwu, stated this, yesterday, in response to a protest by some women in the community, who reportedly acted on the prompting of the cabal nursing grievances for being denied the chance to siphon the treasury of the polytechnic. Onuchukwu expressed surprise that the women could be lobbied by the same group of cabal to protest against the current administration of Prof. Godwin Onu, despite his unequalled level of development in the institution. It was gathered that the women numbering about 20 were carrying placards with the different inscriptions and were saying that they were told that the Rector was planning to relocate the polytechnic to his Ezira home town which is about ten minutes drive from Oko. Our reporter gathered that the protesting women accused the rector of masterminding the ongoing ASUP strike which has resulted to the economic difficulties in the community because of low patronage by students in the area, adding that the rector has been sending the students to other institutions for admission. The women also blamed Prof Onu for admitting a representative from another community on behalf of Oko in the just constituted Governing Council of the polytechnic and accused him further of engaging some widows from the community in the polytechnic without paying them for several months. This entry was posted in News, Politics, Women and tagged Oko women protest.